Waverley writer Laraine Sole chose Aramoho's social history around the 1950s for her book because they were becoming the "forgotten years". Aramoho, the Community on the River, the early years will be launched today and is Ms Sole's second of a series planned to cover Wanganui... read full description below. Waverley writer Laraine Sole chose Aramoho's social history around the 1950s for her book because they were becoming the "forgotten years". 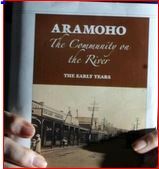 Aramoho, the Community on the River, the early years will be launched today and is Ms Sole's second of a series planned to cover Wanganui's suburbs. The first was Castlecliff, the Community on the Coast. "Many people have contributed their stories and photographs to make this book an easy but informative read." The 280 pages contain a lot of photographs which Ms Sole says most readers have probably not been seen before. "I like to think of my books as launching pads for people to start capturing their own family stories for future generations." The book starts with the early history of the iwi, then progresses to an overview of the town's history, then goes into specifics. It is divided into 23 chapters.